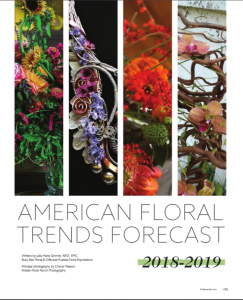 Wrapped inside the pages of the January 2018 issue of Florist’s Review is the 2018-19 American Floral Trends Forecast. This year, the annual report includes more flowers from Certified American Grown farms, more designers, more voices, more photos and, of course, an in-depth look into the designs, flowers and colors that will influence floral design over the next two years. Think terms like Hanami, Crescendo, Kaleidoscope, Wildroot – movements floral designers and flower aficionados need to learn about, and then work to create. The trend selections were influenced by some exciting and important players in the industry, including eight trend consultants and 10 floral designers. We’re talking names like Holly Heider Chapple, Hitomi Gilliam, Laura Daluga, Laura Dowling, Kristine Kratt and Bill Schaffer, Mandy Majerik, Michael McCarthy, Ania Norwood, John Regan, Rodrigo Varito Vasquez and Keith White, who also was the creative director for the publication. And a host of Certified American Grown farms contributed the flowers for the spectacular on-trend designs showcased in the publication, including Camflor, Dramm & Echter, Eufloria Flowers, Green Valley Floral, Ocean View Flowers, Resendiz Brothers Protea Growers, Scenic Place Peonies and The Sun Valley Group. These farms assured that the beauty among the pages featured sustainably grown, homegrown flowers! 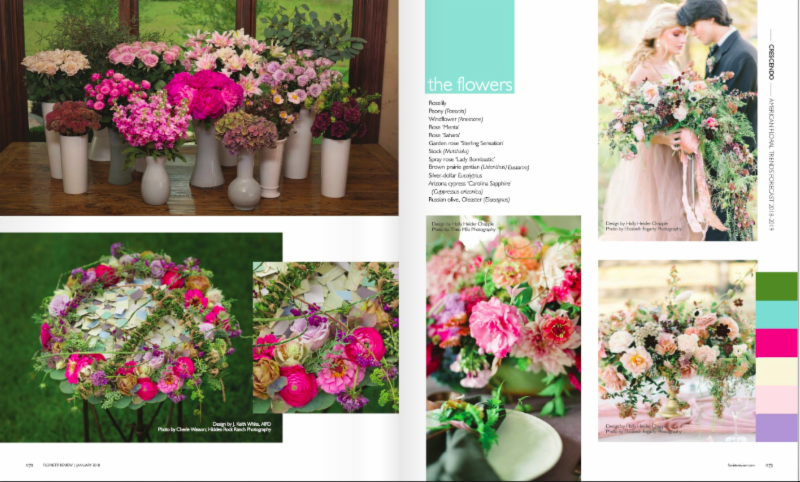 The pages of the 2018-19 Floral Trends Report are filled with gorgeous photography capturing the beauty of American Grown trend-setting flowers. The trends touted emerged from a variety of forces such as interior design, the fashion and textile industries, global cultures, and social and cultural issues and movements. There are also nods to pop culture, media and social and sporting events. The forecast, sponsored in part by Certified American Grown Flowers, is must-read, thanks to the contributions of the influencers, the amazing photography and the inspirational guidance!